Redguard is the first (and probably only) game in the spinoff series called The Elder Scrolls Adventures. 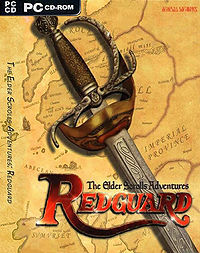 Unlike the main sequence of Elder Scrolls role-playing games, Redguard is designed as an action-adventure game. The player character is Cyrus, a Redguard mercenary, who returns to his native Stros M'Kai in search of his missing sister, Iszara. Cheats — Ways to achieve success that might not be considered quite "legal"
Esta página foi modificada pela última vez à(s) 00h50min de 22 de setembro de 2015.